Also known as ‘sightline kills’, high fencing is the installation of 1.20 m high panels on top of the barrier line. This blocks the view of the crowd at certain places preventing unwanted pressure points building at the entrances and sides of stage areas as people tend not to go where sightlines are blocked. In light of crowd control and crowd management, high fencing is an easy way to prevent blockage of entrances and/or exits. The security walkway is a specially designed, quick to build, seamless system to be placed at the back of the barrier line, including all corners. Normally this barrier line is only outfitted with rear steps on the back. 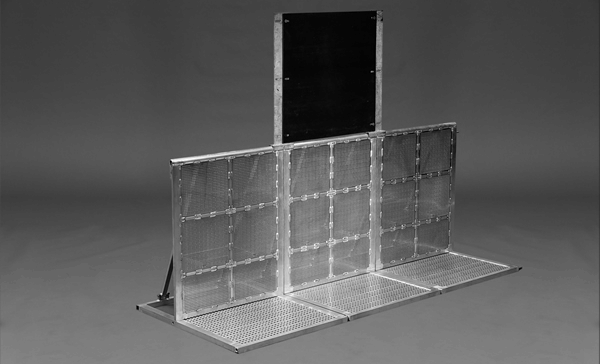 This additional system creates a heightened additional 1.00 m wide working platform behind the barrier line, with no open gaps between the regular rear steps. This allows security and medical personnel better audience observation and access. Wedges are narrow 5.5° fixed corner sections. With a width of less than 0.50 m, they are used to slowly curve the entire barrier line, for instance in front of a large stage, shaping it slightly around the stage. Such shaping of the barrier allows for crowd pressure to be turned slightly sideways. It connects to all other barrier sections with a single bolt and has a double brace but no rear step.